Want to bring along your furry friend? We welcome pets of all kinds! We offer a full RV hook-up to a 50/30/20 amp for your comfort. Conveniently located near casinos, outdoor activities, museums, and more! Since 1960, Cedarville RV Park has been welcoming travelers and long-term residents alike to our well kept, conveniently located facilities. Our primary goal is always to help make your stay with us as comfortable, fun and fruitful as possible. 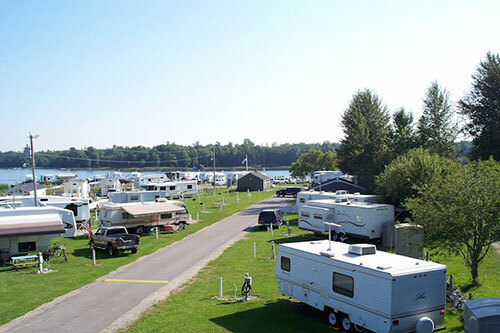 Cedarville RV Park is the premier booking site and RV park in Cedarville, MI, and has been offering the best in outdoor destinations since 1960. We are located on the shore of Lake Huron in the midst of the Les Cheneaux Islands. Our goal is to deliver helpful and personalized service, and we will help you make the most of your stay. There is no end to the activities you can enjoy while staying here, including but not limited to golf, biking, fishing, hiking, swimming, traveling to neighboring islands, boating and so much more. We are a locally owned and operated small business in Cedarville, MI. We are proud members of Camp Native, the ARVC and the Michigan ARVC. Our amenities include kayak rental, protected waters and more. We offer close proximity to a wide range of fun attractions. Our rates are very competitive in the area. For more information on availability or to inquire about condo RV lots for sale, please call Jon at 906-484-3351 (Summer) or (906) 484-3310 (Winter).
" I can't say enough about this RV park, John and his wife are very accommodating. Love this park"
"We have stayed at Cedarville RV Park for two seasons thus far. The owner takes great care of the park, and the area is absolutely fabulous!" "It is located in the town and on the lake which gives you a very nice view, and there's a boat dock with seating to watch activities on this..."